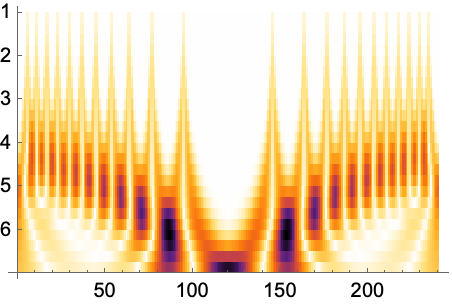 plots wavelet vector coefficients in a DiscreteWaveletData or ContinuousWaveletData object wd. plots wavelet coefficients corresponding to the wavelet index specification wind. applies func to coefficients before plotting. 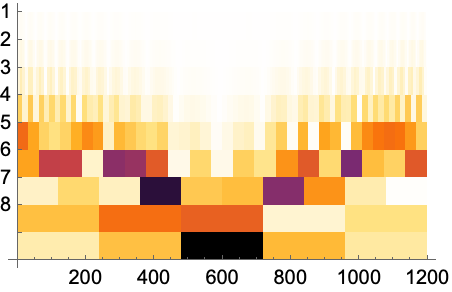 WaveletScalogram plots the transform coefficients as rows of colorized rectangles, in which large absolute values are shown darker and each subsequent row corresponds to different wavelet index specifications. The wavelet index specification wind is the same as used by DiscreteWaveletData or ContinuousWaveletData. WaveletScalogram[wd] is equivalent to WaveletScalogram[wd,Automatic]. WaveletScalogram returns a Graphics object.